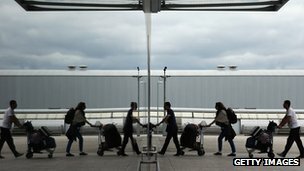 China Investment Corporation (CIC), the country’s sovereign wealth fund, has bought a 10% stake in the firm that owns London’s Heathrow airport. Heathrow Airport Holdings’ other UK airports include Stansted, Southampton, Glasgow and Aberdeen. CIC was set up in 2007 to invest some of China’s foreign exchange reserves. Despite concerns in other countries about Chinese access to key assets, the UK has been developing closer business ties with China. “It is fair to say that the UK has a more open relationship with China than many other major economies,” said Stephen Joske, senior manager at Australia Super, a pension fund based in Beijing. “There is certainly push all around the world for scrutiny of Chinese investment – it has been ringing alarm bells.